Great Graphic: Large Yuan Devalution In 2016? Home » Great Graphic: Large Yuan Devalution In 2016? We suggest that China has merely confirmed what it has been doing. The close link between the yuan and dollar prevents China from pursuing a more independent monetary policy. The removal of accommodation by the Federal Reserve, which is widely expected this week, is not appropriate for China, though the data over the weekend (industrial output, retail sales, and fixed asset investment) suggests the world’s second largest economy may be stabilizing. One key issue is whether China’s declaratory policy will match its operational policy. Chinese officials have spoken before about managing the yuan against a basket and letting market forces have greater sway in driving the exchange rate. The main problem lies not with the declaratory policy, but the fact that it is not matched in practice (operationally). A weaker yuan and the capital outflows China is experiencing translates into weaker demand for US Treasuries. From from being a setback, the US Treasury has encouraged China to stop intervening in the foreign exchange market. It also has argued against China, and other foreign central banks, from buying US Treasuries instead of allowing currencies to adjust. This Great Graphic from the Wall Street Journal shows that economists are divided on the outlook for a significant devaluation in 2016. It is not clear from the article precisely what is meant by a “significant” devaluation. 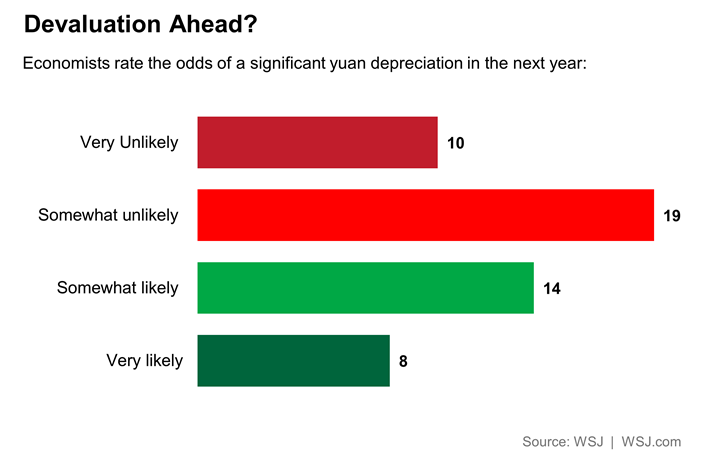 Roughly 57% of the surveyed economists think that significant depreciation of the yuan is very or somewhat unlikely, while 43% think it is somewhat or very likely. Litecoin Price Update, More Upside Ahead?